If you work with businesses that may invest at least $500,000 in their facilities and add at least 10 employees, please join us to learn how the Job Creation Fund can spur that growth. Officials from the Minnesota Development of Employment and Economic Development will be holding meetings throughout Minnesota to discuss the program and how to access the $24 million in available funds. 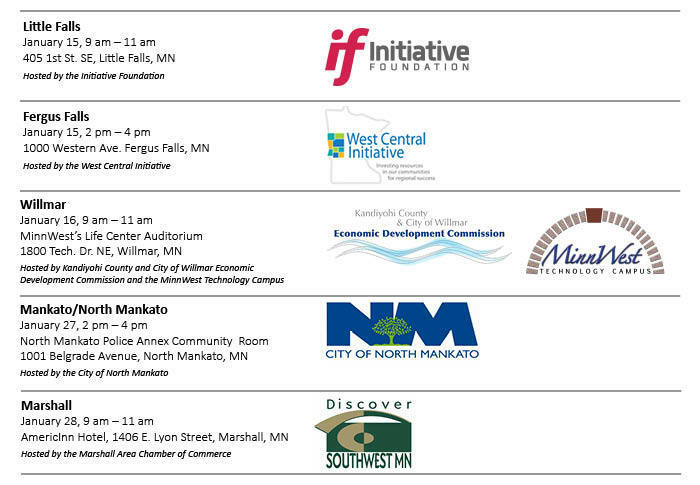 Other meetings will be held in: Duluth, Grand Rapids, Bemidji, Thief River Falls, Rochester and the Twin Cities. The dates and locations of these meetings will be announced once finalized. We look forward to seeing you and answering any questions you may have. Additional information about the JCF (including eligibility and reporting requirements) is available on our website.